58 is a composite number. 58 = 1 x 58 or 2 x 29. Factors of 58: 1, 2, 29, 58. Prime Factorization: 58 = 2 x 29. 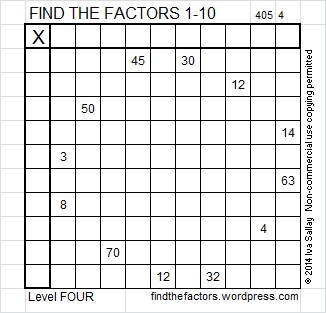 58 is never a clue in the FIND THE FACTORS puzzles. Hugs and Kisses, OXOXOXOXOXOXOX, these were some of my stepmother’s favorite things. 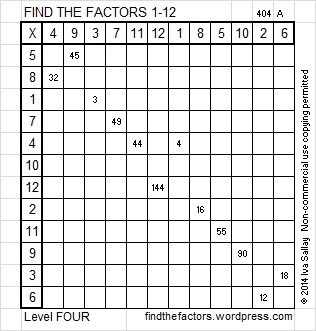 This week in anticipation of Valentine’s Day next week, I’ve included both an X puzzle and this O puzzle. Valentine’s Day was also my dad’s and my stepmother’s wedding anniversary, and she always made sure it was a special day for everyone who lived in our house. I’m sure that you also have many happy Valentine’s Day memories. To solve this O puzzle, consider the clues given in the puzzle. 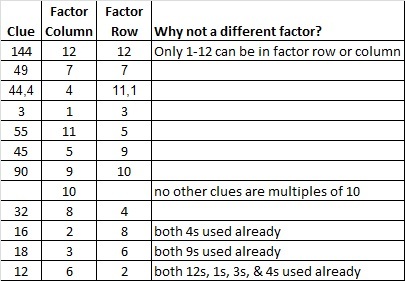 Then write the numbers 1-12 in the top row and again in the first column so that the puzzle becomes a multiplication table. ← 57 and Cupid’s arrow is on its way!